Landscape design Scottsdale is all about landscaping personalization. Whether you have a sprawling Scottsdale estate or small side yard, landscaping can turn it into your own private Scottsdale oasis. There are so many designs to consider. Would water features look right? What about low-water xeriscaping design? Is there a certain aesthetic you've always pictured? 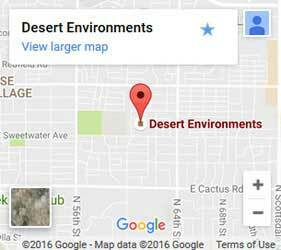 At Desert Environments, we specialize in designing Scottsdale landscapes that are tailored to you. These landscaping designs frequently integrate bathing areas, outdoor sitting areas, and more. We can install televisions, surround sound systems, and provide you with indoor luxuries and comforts while you enjoy the great Scottsdale outdoors. Entertainers love to bring family and friends together. We can install fire pits, fountains, barbecues, and other major focal points that help you enjoy company while providing a centralized point for gathering. 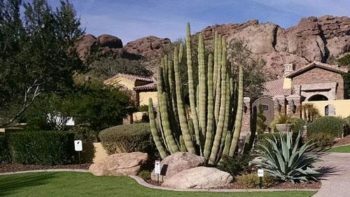 Whether it's the design and installation of an automatic watering system for your favorite native and non-native plant species or desert focused xeriscaping, we make it beautiful. Our designers work with the natural flows of the Scottsdale environment and can integrate areas for gardening and vegetable growth into the design. As local design experts, we understand the Scottsdale, Arizona desert. We know what grows best and where, how to account for the hottest time of day, and how to create a landscape design that works in dry Scottsdale environments. 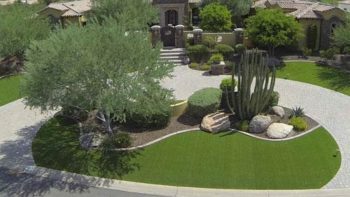 As your Scottdale landscape design company, we'll design a landscape that you'll enjoy for years to come in Scottsdale. Let's get your Scottsdale design started.